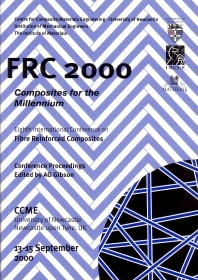 This book presents the proceeding of the 8th in this successful series of conferences organised by the Centre for Composite Materials Engineering of the University of Newcastle upon Tyne and sponsored by the Institute of Mechanical Engineers (ImechE) and The Institute of Materials (IoM). The papers presented show how FRCs are being used in a steadily increasing range of technologies and how their properties make them appropriate choices for designers and processors interested in exploiting the potential of these highly versatile materials. Composites applications now extend well beyond their established uses in aerospace, marine and land transport and, although exciting developments are still taking place in these fields, it is the rapidly expanding range of civil engineering and infrastructure applications which offers the greatest potential for novel uses. FRC's high strength, light weight and durability make them appropriate for large scale structures and, as these proceedings demonstrate, they are increasingly being specified as an advantageous alternative to more traditional materials. The papers are arranged under the following headings: Applications and new developments; Composite processing; Composite properties; Materials modelling; Green composites.